From nearby Mount Hood to further, and equally scenic, destinations in southern and central Oregon, plenty of opportunities provide would-be snowshoers with the chance to see nature in a whole new—if not colder—light. Here are a few ideal spots for snowshoeing around Portland, where outdoor enthusiasts can make the most of an unusually warm winter. Roughly 60 miles west of Portland, the Mount Hood National Forest receives about 400 inches of snowfall each year and provides snowshoers with close-up views of Mount Hood—the highest point in Oregon. 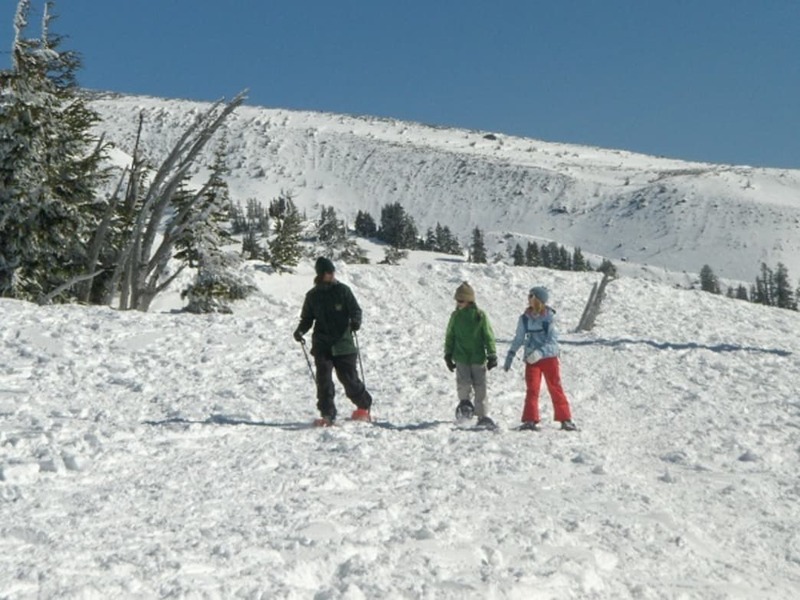 Portlanders flock to the Mount Hood area for winter skiing and summer hiking, but snowshoeing provides a vastly different experience, says Neal Fair, U.S. Forest Service conservation education coordinator. “There’s nothing quite like a quiet walk among the snow-covered trees, hearing only the calls of the birds, and seeing the tracks of elusive animals which are only found in the mountains,” he says. Snowshoers might see (the aptly named) snowshoe hare, fox, bobcat, bear, mountain lion, and wolverine tracks along the way. Free, ranger-led snowshoe tours cover the celebrated forest, and full-moon tours at Timberline Lodge are offered throughout the season. The Three Sisters might be Central Oregon’s most famous peaks, but Mount Bachelor remains an alluring destination for skiers and snowshoers. The region’s unique geography means a mix of flat hikes and mountainous climbs, and all five sno-parks along Century Drive allow snowshoeing. Of course, snowshoers can take in views of the beautiful Three Sisters Wilderness Area along the way. 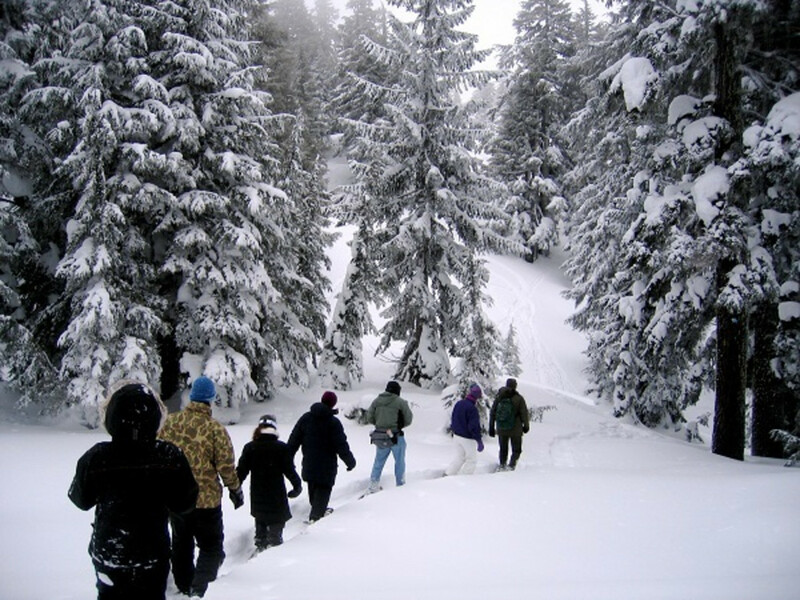 U.S. Forest Service naturalists offer free tours throughout the winter and early spring. Crater Lake National Park is Oregon’s only national park and is one of the state’s most popular tourist destinations. 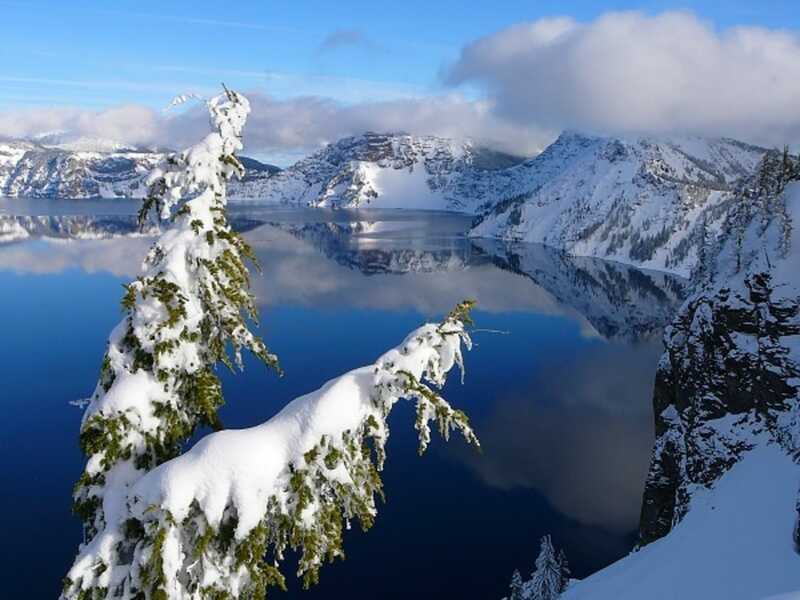 While thousands of visitors crowd Crater Lake throughout the summer, the park remains open throughout the winter for snowshoeing. Given that the park receives 44 feet of snowfall each year, the stunning lake provides the perfect backdrop for newbies and veterans alike; the entire 33-mile road around the rim of the lake is open, allowing snowshoers to tackle a mix of leisurely walks, challenging day trips, and multi-day backpacking treks. Melissa Meitle, a ranger at Crater Lake National Park, points to the solitude as one reason to snowshoe at Crater Lake. During the summer, thousands of motorists drive around the park every day; in the winter, however, snowshoers can trek the same 33 miles and never encounter another person. “There is something amazing when it’s just you and the lake,” she says. Ranger-led snowshoe walks are offered Saturdays and Sundays throughout the winter and early spring. Tours include free snowshoe rentals.